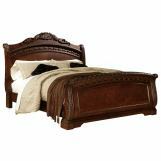 The North Shore Bedroom Set by Millenium combines traditional design with modern sophistication. 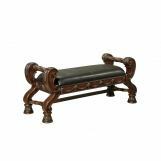 Spiral pilasters, intricate flourishes, and floral motifs adorn dark rich wood in this luxurious bedroom collection that brings elegance and grace to any home. 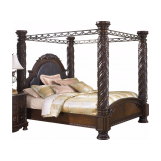 The Canopy Bed features a removable canopy atop four majestic columns and an upholstered headboard, providing comfort and style. Repose in the lap of luxury with the Millennium North Shore Collection. This North Shore Panel Bed combines traditional style with modern sophistication. 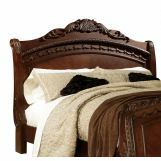 Featuring marble veneer caps inlaid upon the handsome panel footboard, this piece enhances any bedroom with a refined elegance that’s impossible to duplicate. Repose in the lap of luxury with the North Shore Collection by Millenium. 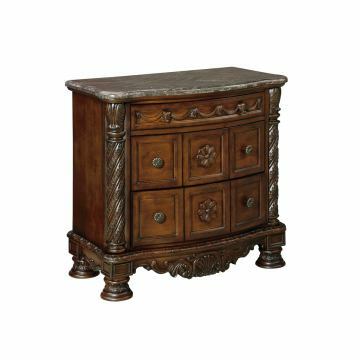 This North Shore Nightstand by Millenium features concealed drawers and ample storage space for your treasured essentials. 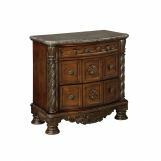 Topped with a gorgeous marble veneer inlay and accented with an ornately decorated apron, this dark hardwood nightstand adds a grand elegance to any bedside. This North Shore Dresser by Millenium boasts a grand, sumptuous design that reflects classical beauty in a contemporary setting. Dark hardwood drawers with floral accents and ribboned motifs hold plenty of storage space for all your treasured belongings. 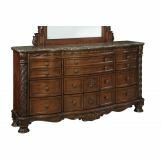 The lustrous marble top completes the serpentine frame and gives this dresser a sturdy strength and sophistication. 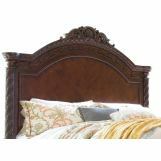 Combine with North Shore Mirror to bring a touch of timeless beauty into your bedroom. 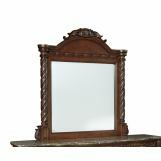 This North Shore Mirror by Millenium is the perfect crowning piece for the North Shore Dresser. With complementary accents, ribboned motifs, and dramatic spiral pilasters, this mirror brings a bright elegance and weightless grace to any bedroom. 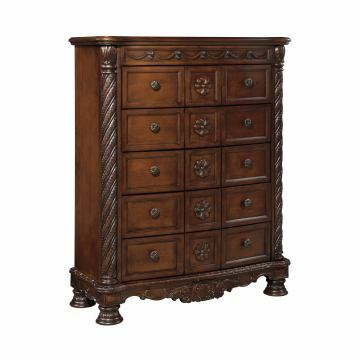 This North Shore Chest by Millenium is crafted from a dark, rich wood and features five large roll-out drawers for effortless access to your clothes, sheets, and belongings. Flanked by dramatic spiral columns and graced with intricate motifs and floral accents, this magnificent drawer brings classical beauty to everyday functionality. This North Shore Media Chest by Millenium brings a touch of sophisticated style to any media room. Featuring an open shelf for your media components and easy access to wire management in the back, this media chest is both functional and stylish. The fine-crafted apron is graced with ribboned motifs, floral accents, and a seashell emblem, bestowing a subtle elegance to your media center and home. The "North Shore" TV stand captures the beautiful look of rich traditional styling with a unique flair that is all its own. Beautifully bathed in a dark casual finish, the contemporary design features dark colored hardware and decorative V-groove glass doors with adjustable shelving. The shelving behind glass doors provides storage for your media components such as your receiver, DVD player or CDs and DVDs. Available with an optional bridge and two side piers to add additional storage space for your pictures or favorite knick knacks to be showcased under lighting within the bridge. Complete the style of any home decor with the traditional design of the "North Shore" TV stand. The price in combination with the simple yet ornate appearance. hi, I have this bedroom set in the light color. Where can I get replacement parts? does the bed come with rails? Best Answer: Yes, rails, slats, and legs for extra support are included. 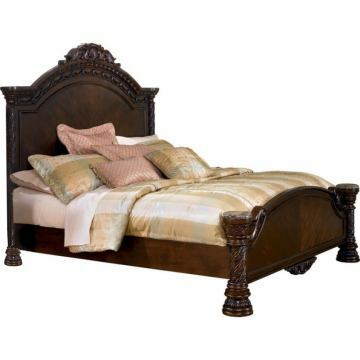 What is the height of the headboard? 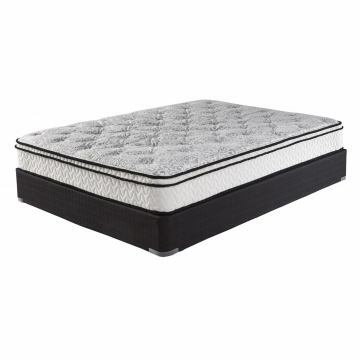 Will an adjustable base work with this bed? Where is this shipped from? Is the top of the nightstand and dresser genuine marble or marble veneer? Furniture is it tax free? what is the top caps of the dresser, nightstand and chest made of? Best Answer: Marble for nightstands and dresser. Wood for chest. 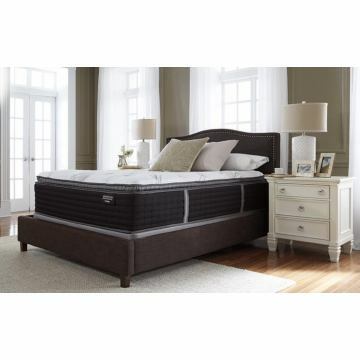 What is the length of the North Shore King Panel bed? Best Answer: It is approximately 96"
This North Shore Collection item features a video.